Two Bears Farm and the Three Cubs: Is Creativity and Craftiness Genetic? Is Creativity and Craftiness Genetic? My recent descent into days of madness crafting left me thinking about the talented women from whom I descended. On one side of the family, my grandmother and great grandmother had a sewing shop. I have one of the old machines that they used in their shop. 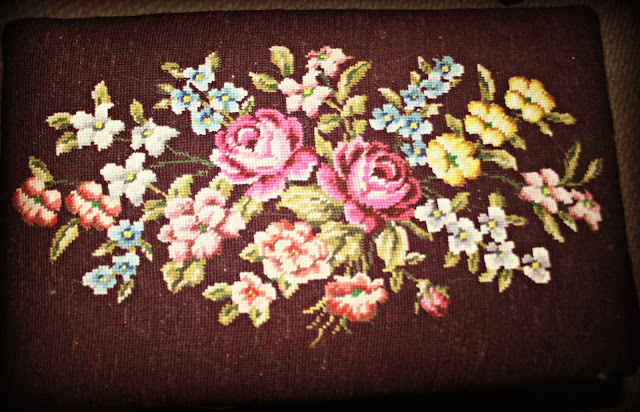 On the other side of the family, I know my grandmother did some needlepoint, as I have this lovely piece on the vanity stool that accompanies her bedroom set. And you know I'm a bit of a psychology nerd, so it's only natural as I toil over my sewing machine, grumbling that I should be destined to be able to make it cooperate with me, that I ponder....is creativity genetic or learned? The answer, no doubt, is that it must be a little of both. My environment growing up, had frequent exposure to craftiness. My mother always had a sewing room wherever we lived (we moved a lot). She sewed my prom dresses and even my simple wedding dress. When Cabbage Patch dolls were all the rage in the early 80s and you had to be wicked lucky to get one, she started crafting dolls that were quite like the Cabbage Patches and selling them in the community. Whenever I needed a costume for some project at school my Mom was right on top of it. Yet I was always a bit of a tomboy, and this craftiness didn't seem to reach my not-for-your-life-are-we-gonna-knit-fingers. I did like working with clay some, dabbling a bit in creating small clay magnet animals for the fridge. I tried cross stitching, which mostly made me mad, as I didn't have much patience for when I messed up, which was very, very frequently. I think that I got the creativity genes from my female ancestors intact, they just seem to have manifested themselves slightly differently. Sure, I seem to have random bursts of craftiness, with small art projects with the boys or more recently with all these tiny (and odd, to me) sewing projects. Mostly, though, I think my genes (which I imagine to be jumping up and down as I write this, and tweeting in excitement like little zebra finches) have decided that instead of doll crafting or painting or pottery, they would much rather......blog. What do you think, readers? Where do you get your creativity? My mom is also really crafty. She used to sew all of my dresses growing up, and has an amazing eye for detail. She also did an extensive amount of gardening. I love doing all that stuff as well, but my real crafty loves are knitting and writing. I wish I could come up with cute projects for the kids to do, and I love looking at pinterest, but, my kids do better (and so do I) just being given some supplies and going to town doing their own thing. I think for the women in my family it is genetic! We ALL craft in numerous ways. It's crazy around my house. Sew (pun intended) many projects started, some completed but usually a shiny object, or my camera, catches my eye and I am off on another project. Are you ready to learn to knit? I think the horse thing must be inherited. My tale is quite similar to your own....oodles of creative craftiness on both sides of the family but me? Sewing machines hate me so I........blog. There is so much creativity in my family - from sewing, drawing, etc. and yet I always considered myself non-creative. If you count my blog though, I guess I'm just creative in a different way. Well this is a tough question I do know my ancestors NEVER blogged something I find very creative and enjoyable but I do know they sewed something I love to do when I am not blogging. I have spurts of craftiness but I think you do inherit the urge to try new things some things stick some things don't. I don't think they are genetic, but rather an interest. My Mom, too, sewed our clothes, knitted, crocheted, macrame'd, etc. I never enjoyed ANY of those interests, although I have needlepointed a few things in decades past. Mom tried to teach me some of the skills she had, but for me there was simply no interest so I simply refused to learn them. After seeing your owls and cake creations, I would say that you inherited the gene too. LOL.... Crafting verses blogging.... and blogging wins!! Every once in awhile I get on a craft kick too,.. not sure what thats all about. My grandma did massive amounts of needlepoint. Your piece reminded me of hers. My Mom was a great knitter and crocheter. Me? More the paper crafting type although I like a varity of things...none of which take after my Mom or Grandma. Who knows! I seem to be the crafty one in the family. and the musically inclined. Not sure where it came from. Ah, the wittyness is back, lol! I think I get my creativity & craftiness from my Dad's side although my Mom did do some sewing in her day and some cross stitch. My Dad enjoys painting and dabbling in wood projects and his sisters and Mom all did needlepoint and knitting. Even though I was a tom-boy growing up I've always done something creative and crafty but it wasn't until recently that I've wanted to learn how to sew, crochet and knit. What inspires my creativity? Many things, including bloggers just like you. my dad was a bit of a doodler - and a crossworder. i think i took after him. I think creativeness can be passed down to to children and grandchildren. I see that musical talent often runs in families so why not craftiness too. Creativity can manifest itself in so many ways. I have inherited my Norwegian great grandmother's spinning wheel which my father remembers watching her spin when he was a lad. I have tried spinning but it didn't gel for me. I used to knit,sew etc but my creativity is in my poetry and photography right now. Rather delightful piece of needlepoint you've inherited. I'm going to argue it's a human need to create and feel productive--in all kinds of mediums. I never took up sewing even though my mom and grandma were experts at it. I kind of feel more drawn to paint and wood based projects. My mom made all my school clothes and gowns until I was about in senior high; happy then to have store bought! And, she made my daughter's clothes also; each outfit had a matching hat, so, so cute! I think everything you do is awesome. Love the needlepoint on the stool too. Lisa, you raise such an interesting question!!!! Well, of course I am all for your creativity being in your blogs, because I am the one to benefit from it!! I do not have a creative bone in my body. My crafting limits stop with doing crafts with the girls. I have just cut out some Irish crepe paper rainbows to make with them ans a few other things. When I was a young mother, I made beautiful crewel work and hung them up. Phil made the frames and I put an animal on each wall of our son's room. And a huge owl in the living room. Now blogging takes up everything, and that is good. Not as solitary, you know! I think I'll agree with Green Girl in Wisconsin - it's a real feeling of need to create for my ownself. I definitely get my creativity from my photography. All of my posts start from there. That tapestry is such a treasure Lisa. How lovely for you to have it. I think it's my sentimental side that spurs creativity for me. Where I'm most creative is ironically where I can spend the least time -- scrapbooking! My mother, when she could still do it, sewed beautifully. She made all my clothes growing up. She also quilted, knitted, crocheted, cooked like a dream, decorated cakes and did all manner of creative things. Me? Well, I can't seem to get the hang of sewing, I can't learn to knit, I don't cook. I can crochet and do cross stitch. I think my real creativity comes out in my writing and in music (I don't play much now, but I used to play the piano and organ). Words are my pieces of art, I guess. My mother was an expert seamstress (in her spare time) and my dad dabbled in pencil sketches. His father painted in oils. Apparently, I got only trace amounts of creativity from my parents who never took time to encourage that part of my life. I love the outdoors which I definitely get from my dad. He took me fishing once. I grew up with a crafty mom who was always getting me into her projects. Was it nature or nuture?! Hard to say! My brother got most of the talent in our family. He is an actor and has always been a great artist. I have done some wonderful crafty in my life but the older I get the worse I've become. I have a sewing/craft room in our house but you can't hardly walk in there because it has somehow turned into the toss it in there room... When I first got it all organized I actually used it. I know I get my craftiness from my mom and Granny. We all seem to have different craftiness type projects that we like to do. Mom loves to paint so I keep her in paint supplies and canvas. She did sew some when I was little. Granny made lots of different things when I was little. I still have the Raggedy Ann and Andy dolls she made. She used to sell them in my great uncle's hotel gift shop. People would put in orders for them. Hard to tell how many she made. If there were some skills in my ancestors I definitely was not privy to them! LOL I soooo wish I was more creative & more crafty. Interesting! I give a whole lecture about creativity and where it comes from. It has to do with genetics, also who you meet along the way and what you are willing to try out. My Dad was an art teacher for years in a middle school. Your mom sounds like me when my kids were growing up. They watched me sewing everything from Pjs to slipcovers. My daughter designed all of her prom dresses and I made them. I don't sew much any longer, but I still love making pillows. Both my kids are extremely artistic, but my daughter doesn't sew. She is a footloose city girl. Maybe when she settles down and has a family her creativity will come out. my mom was an English teacher/writer, so I got that bug from her. The other crafts I've tried (and failed at some) I picked up b/c I saw something that intrigued me and I wanted to learn it. The interesting thing to me is...I've crafted/created all kinds of things, but I never stick w/ stuff for more than about 2 years. Then, I'm on to the next thing. I don't know if I just get tired of quilting/pottery/cross-stitch, cake decorating, etc, or I'm psychitzo.